Have you read the introduction to the walk? 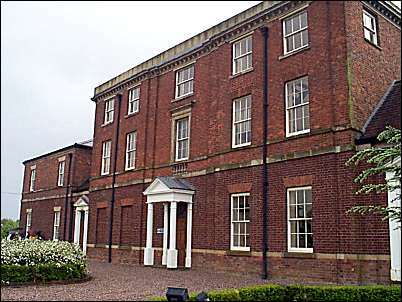 Etruria Hall was constructed between 1768 and 1771 to a design produced by Joseph Pickford on rising ground midway between the factory and the Ridge House. Another large detached house called Bank House was built at the same time near Etruria Road to accommodated Thomas Bentley. However he declined to take up residence there, preferring to remain in Liverpool. 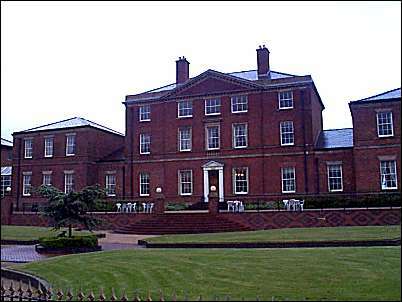 The Wedgwood family moved to Bank House in November 1769 and into Etruria Hail upon its completion in 1771. The original house was a typical symmetrical Georgian house of three stories shown in the illustration on the next page. The house was clearly visible from the other side of the valley, a conscious expression of the wealth and social standing of its owner. As Wedgwood’s family increased in size preparations were made for extending the house and in 1780 two wings, two stories in height, joined by a single story corridor were added to the Hall. They housed bedchambers for Wedgwood’s children, a school room and billiard room, and a bedchamber for Alexander Chisholm, Wedgwood’s assistant, as well as a drawing room 30 feet by 20 feet long. The extended Hall is shown on the 1877 Ordnance Survey map of Etruria Hall. Between 1781 and 1787 the sculptor John Flaxman completed drawings for ceilings, ornamental friezes and chimney pieces but it is not clear whether all of these were implemented. Front of Etruria Hall which looks towards Basford. William Emes landscaped the park and garden surrounding the house and his design included a Chinese bridge, summer house, fish ponds and nurseries. A survey of 1780 shows that these features took up about 4 acres of land but there is no early plan of the estate and the precise configuration of the 18th C gardens cannot be determined. However plans of the 1820's and 1830's show a dearly defined central spine running north-south across the estate with gardens, plantations and an ornamental pool in the vicinity of the Ridge House connected by a carriage drive to the Hall which continued south to exit on the Etruria Road just north of the canal. The factory was screened from the Hall by a plantation on the opposite side of the Trent and Mersey Canal (see 1832 map). Trees were planted around the house to hide the service areas but there was a clear view from the back of the house and the terrace below it over the Fowlea Valley towards Basford Bank and Wolstanton Church. Josiah Wedgwood and his family lived in a house fit for a country gentleman. Not surprisingly he was addressed in his correspondence as “Esquire” when that title still differentiated the gentry from the rest of the population. Josiah Wedgwood died at Etruria Hall in 1795 a multi-millionaire by today’s standards and was buried in Stoke churchyard.